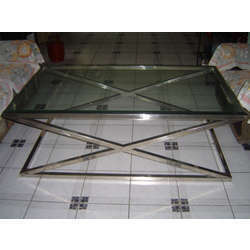 Stainless steel coffee table with glass top with polish finish, the same design are available in different sizes. In line with clients' diverse requirements, we are involved in providing an optimum quality range of Glass Top Coffee Table. - Price Mentioned for Size:- Width=36", Depth=24" , Height=16"
Set of 4 Side Tables with Glass Top & Brass Plate. This Extra Clear Glass is available in any thickness. These glasses can be toughened. Owing to our rich industrial experience and expertise in this business, we are instrumental in presenting Glass Top Dining Table. 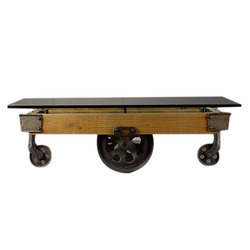 We are an eminent entity engaged in offering an extensive range of Glass Top Dining Table. Being a foremost organization in this industry, we are actively engaged in offering the finest quality range of Glass Top Dining Table. Matching up with the ever increasing requirements of the customers, we are engaged in providing Glass Top Dining Table Set.